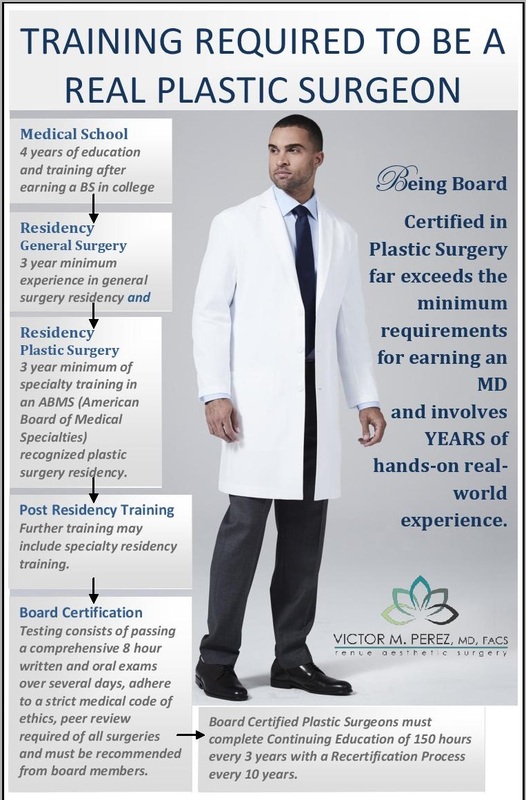 Being Board Certified in Plastic Surgery far exceeds the minimum requirements for earning an MD and involves YEARS of hands-on-real-world experience. First 4 years Bachelors degree from a University or College, followed by 4 years of Medical School education and training. Next a 3 year minimum experience in general surgery residency and 3 year minimum of specialty training in an ABMS (American Board of Medical Specialties) recognized plastic surgery residency. Post Residency Training may include further specialty residency training. Once doctors have completed their residency they prepare for their Board. Testing consists of passing a comprehensive 8 hour written and oral exams over several days, adhere to a strict medical code of ethics, peer review required of all surgeries and must be recommended from board members. Board Certified Plastic Surgeons must complete Continuing Education of 150 hours every 3 years with a Recertification Process every 10 years.